Hype is a funny thing. When you’ve constantly got your head dunked in the noise of the industry, it’s difficult to get overly excited when a new product comes along. 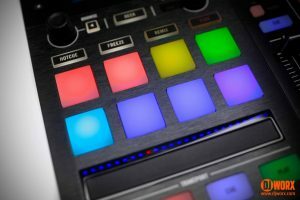 Native Instruments’ Stem files launch was the last big piece of news that really got me excited, with the Kontrol S8 piquing my interest a year ago. It’s not just fanboyism, though. I’m an ardent pessimist when it comes to all-in-one controllers: the S8 was fun, but I’ll always choose modular whenever possible. 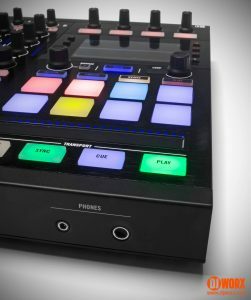 When the Kontrol S5 images first did the rounds within the DJWORX team, it didn’t look that much different from the S8… yet seemed hampered in its functionality. I was actually most surprised by the fact that the S8’s baby sibling had four decks. I was expecting a two-channel S2 analogue, sort of a like a screen-laden Novation Twitch (a good, but slightly flawed, controller). As a side note, It might be worth reading Jared’s most non-heinous review of the S8 from late last year to get a good idea of the intricacies of what Native Instruments’ flagship controller is capable of compared to this one. There might be a lot of crossover, but they definitely have their own identities, and as such, understanding what they both offer will best inform you as to which (if any) would suit you. 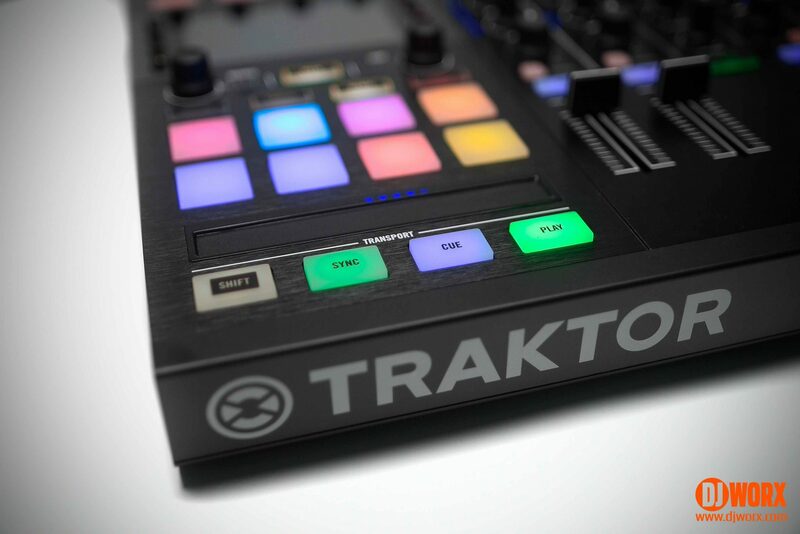 The Traktor Kontrol S5 is a four-channel Traktor Pro 2 controller with two colour screens that’s compact and features control for the new Stem file format and Traktor’s remix decks. In usual NI fashion, there’s been some thought put into the packaging design for the Kontrol S5. The company has managed to standardise their offerings pretty well, so there’s no real surprises here. Along with the 1.5 metre USB cable, you get the standard AC power supply with snap-on international adapters in case you take a fancy to rocking out in Germany or Taiwan or anywhere. There’s the comically huge quick start guide, which is daft looking but actually quite useful. You also obviously get your download code for the full version of Traktor Pro 2 (not Scratch, mind). Native Instruments has been pretty consistent in in the industrial design of its hardware products. In all the time I’ve used their gear (since the X1 MK1), I’ve only really ever known of a few disappointments: The USB ports on some controllers are a bit flimsy, and, for some reason, the loop knobs on the X1 MK2 in the studio decided to fall off. Every bit of gear is designed to be rugged, and NI’s choice of buttons and sliders are great. The Kontrol S5 follows suit. Everything is solid, easy to locate, LEDs are bright, and the screens are as top-notch as ever. The LED brightness can be adjusted to suit your tastes, but I’m always impressed with how vibrant they are. It’s the same with the screens. Something I noticed about them while in use is the viewing angle. Yes, they’re likely the same ones as the S8, but having spent much more time with this controller, I’ve noticed you can see what’s happening on the screens from pretty much any angle you might be looking. It’s easy to take a glance at this controller and compare the layout to the S8 to see what’s missing. There are no stems/remix volume sliders. It only has two FX units, one on each deck. But there’s certainly been some thought put into the layout and control. The reality is though that it’s smaller than S8, and has less functionality, but the price tag does reflect that fairly. You still get all the major features from the software for fundamental four-deck mixing. The mixer section is straightforward, whether you’re familiar with Traktor gear or not. There’s four channels of volume, EQ, filters, trims and cue toggle, effects select, along with the usual master/booth/cue volume controls plus a crossfader. Speaking of crossfaders, the question that always pops up can be answered with a simple ‘no’. The Kontrol S5 isn’t ‘Innofader compatible’ because the crossfader isn’t user replaceable. 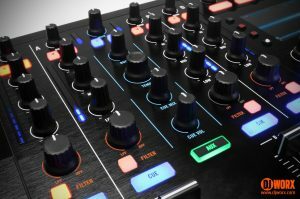 Before we get yet another round of “OMG NI have abandoned scratch DJs!” you need to stop and think about what niche (pronounced ‘neesh’, FYI) this controller fills. Yeah, I guess it’s a bit disappointing that it’s not a user-replaceable part, but how many people that buy this are really going to mash their crossfader? The decks can be broken down into the screen section, performance section, transport, and effects units. I cover the nitty gritty of their implementation below, but as you’d expect, the workflow fits perfectly with Traktor Pro 2. The latest big thing with Traktor, software-wise, was the brand new stem file format which came out a few months ago. Functionality for playing the multi-track music format fit snuggly into the remix deck controls on the F1, S8, and D2s. The S5, on the other hand, is missing some of that core functionality (namely the four volume faders). So how does it work then? 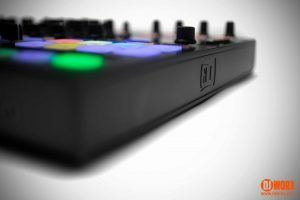 Rather than rely on dedicated controls for volume and filters, the Kontrol S5 co-opts the BROWSE and LOOP encoders when a stem deck is active. The performance pads are used to mute channels (top row) and activate channels for volume control (bottom row). And it does work… I guess. I’ve had worse (much worse) shift mappings on controllers (I’m looking at you, Jockey 3 Remix), but coming from the S8/D2 (and even F1) workflow, using stem files on the S5 just feels shallow. I can fully understand that if this was your only controller, and you played with stems, you could do some decent stuff. It’s not that the S5 gets in the way of stems control. Rather, it doesn’t free you like the S8 does. 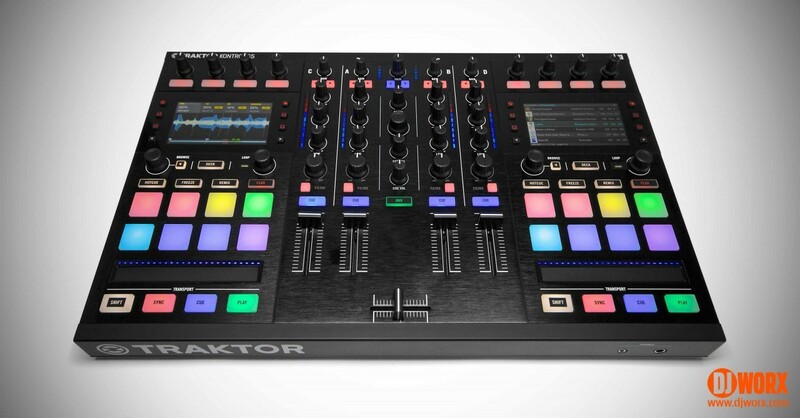 The other big (and underrated, I might add) feature in Traktor is the remix deck. 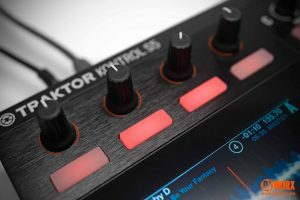 The Kontrol S5 offers some degree of control of remix decks, but unlike the stem mapping, there’s no clip volume control nor filter. You can toggle mute for individual clips, but this is pales in comparison with other controllers in the… erm… Kontrol range. I found that unless your remix pack clips all have the exact same volume level, there’s going to be a noticeable difference in volumes that you just can’t tweak. A quick glance at the top quarter of the controller will show that there are four knobs and buttons on each side, giving control of two effects units. This all works the same as you’d expect, with each of the four audio channels able to assign FX 1 and 2 as you need them. You’re able to scroll through and change which effects you’re using by using shift and the orange buttons. The knobs are capacitive, meaning the effects information pops up on the screen when held, exactly like the S8 and D2. I did notice a bug with the effects panel on the screens: for some reason the effects controls got stuck on screen, covering the track info at the top. Normally the touch sensitive knobs show and hide the information, but at least once in my testing, it remained until I restarted the unit. It’s not (literally) a show-stopper, but was a bit distracting, and not something I’d seen before. While the S5 doesn’t have channel inputs like its deluxe sibling, you do have inputs for a microphone and stereo RCA. Confusingly, the AUX input works differently when plugged in to laptop and idle but powered. When powered up but unplugged from a laptop, you toggle on the AUX input using the button in the middle of the controller. Once that’s lit, you use hold the button and use the touch strips to change volume. Left side for microphone, right for RCA. 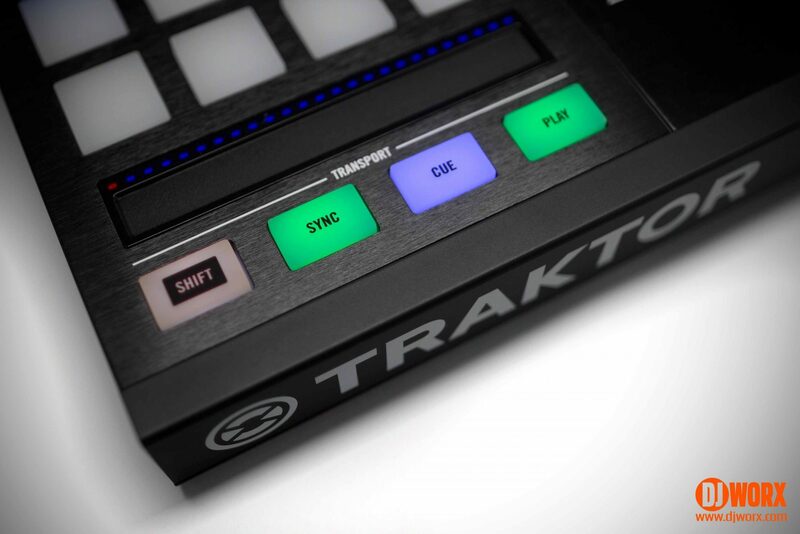 When running the S5 with Traktor, you will need to run the inputs through one of the decks as a LIVE INPUT, giving it the behaviour of any other channel, but losing that deck for music. 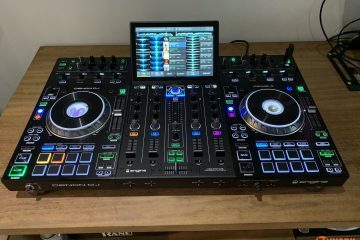 Personally, I think it would have been nice to have the AUX inputs as a sort of extra channel, working independently of the mixer section and using the touch strips for volume, to ensure consistent UX. I’ve put in about three solid hours of uninterrupted play on the S5 and, I have to say, I actually prefer it to the S8 for mixing. Why? Could it be the more compact form factor? Am I more used to the concept after using both this a the S8 a few times? Is it simpler? I think it’s probably a mixture of things. I’ll say this: For pure mixing (and dabbling in stems) this is now my favourite all-in-one controller. I took the controller over to a friend’s house, who has a Kontrol Z2, turntables and vinyl timecode/music for a bit of a jam, and ran the Kontrol S5 out to one of the channel line-ins for a bit of a back to back sesh. I must admit I was a bit nervous about trying to beatmatch out of his three or four tracks as the method for it is so drastically different: you use the tempo encoder to change the pitch of the master track, and the touch strip to nudge, like you would on CDJs or records. I was pretty much confident with the system after the first track, with the only ambiguous part being the sensitivity of the =/- nudge on the strip. It might not be ideal for stem files but even with the limited control, you could easily get used to making do with it. Unfortunately, it is just way too difficult a workflow for remix decks without the individual volume control. 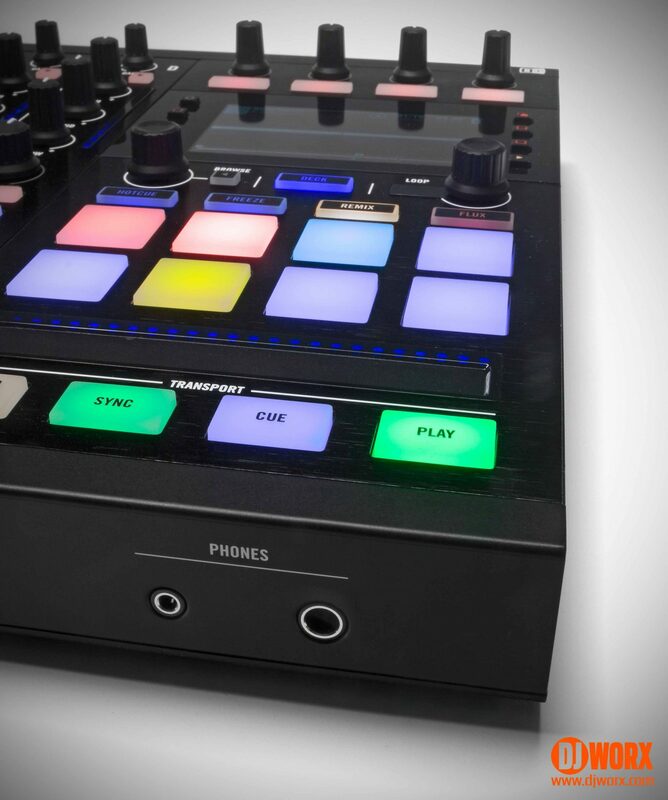 Really though, I would still recommend using a Kontrol F1 as the best value controller for both stem files and remix decks along with the S5. Speaking of stem files… The biggest struggle I find with them is that acquiring them from online stores is completely counter to how I collect music. I haven’t actually bought any since NI sent a pack of them to try out when they were first released. The bulk of my music purchases come from hearing mixes online, podcasts, new releases from artists, and without actively checking for stem file versions, there’s no way of knowing if they’re available. 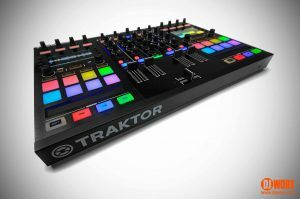 Really, I can totally see them really coming into their own as a sort of hybrid with remix decks: short, simple looped tracks that let you dip in and out of the different elements to build up super-blends and textures. Producer/DJs that are able to create their own stem files have got to see the potential in that. 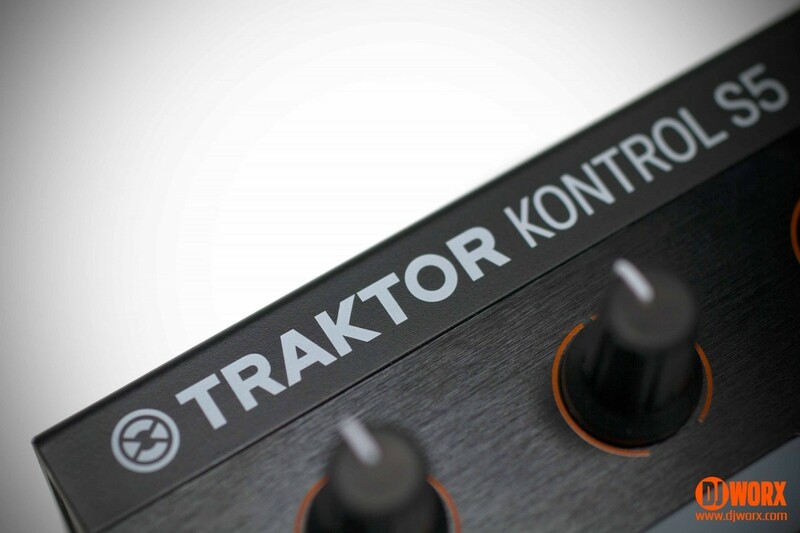 Most of my wants for the Kontrol S5 come from the shortcomings of the software attached to it, Traktor Pro 2.x. The usual request for a rebuilt Traktor engine is a given, but the main thing is to take the screen workflow to the next level. Letting the screens display independent playlists would be useful, as would some way to customise what columns display in the library. 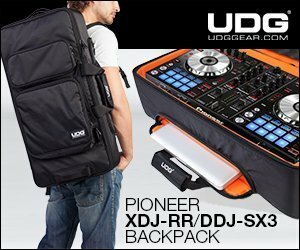 Finally, allowing the screens to continue working when the laptop isn’t focused on Traktor. As for hardware, I’d much rather a non-software based implementation of the AUX ins. Being able to run audio in as a separate, analogue audio channel would not only provide a safety net should the laptop fail, it would also give us a cheeky extra channel to run an outside source. While not full bells ‘n’ whistles like the S8, the Kontrol S5 is a very portable, very capable four deck mixing machine. The lack of stem/remix volume control is pretty inevitable when trying to fit everything into the smaller package. Native Instruments might tout this as “stems-ready”, but I’d personally call it “stems at a pinch”, and there’s just too much functionality lost with remix decks to be useful. But for those of us that don’t need the jogwheels the S4 offers, the S5 is very fun for pure track mixing and a nice compromise on price vs features compared to the S8. I still feel the current implementation of the screen function is a bit of a fudge, since the screens freeze when you’re off-app, either when the laptop screen goes off or you’re tabbed out of Traktor. There’s a growing army of Traktor users eagerly waiting for some sort of news on Traktor 3, and there are issues like this just begging to be ironed out. Like the S8, the S5 isn’t for everyone, but it’s definitely the best fun I’ve had on an all-in-one for a good while. The simpler controls, along with having more time to get used to the workflow meant I was getting the most out of it. 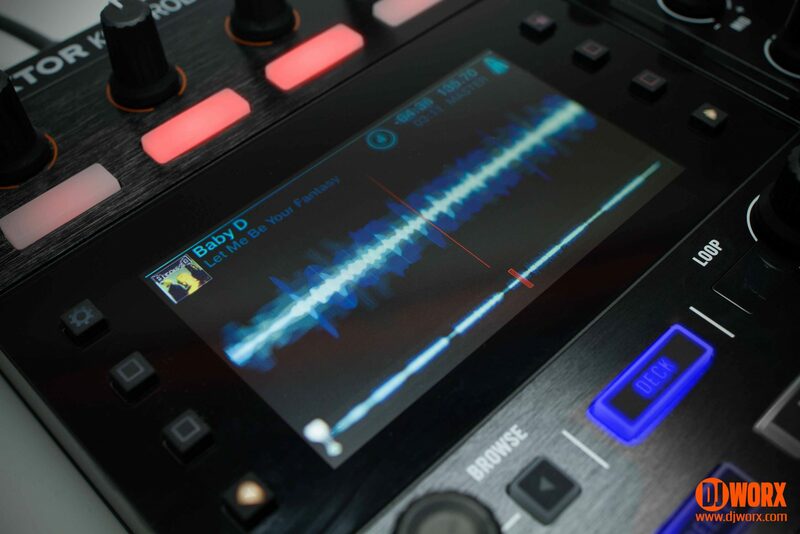 Once you accept it’s really designed for four deck mixing, the S5 is a great bit of kit. 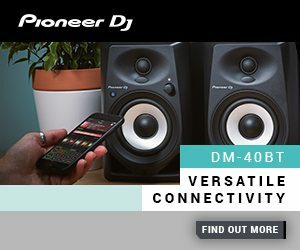 If you need DVS built in, want access to full remix deck control, and still want a single controller, there’s an option for that. 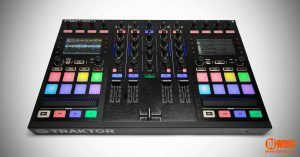 If you love Traktor, like where Native Instruments are taking it and want to slam some beats and experiment with more advanced features at a decent price point, there isn’t really much more you could ask for than the Traktor Kontrol S5. Native Instruments has consistently high quality hardware and this is no exception. The S5 packs a lot of functionality into its tiny frame. Some of it more intuitive than others. A great price for straightforward Traktor DJing, the way Native Instruments envisions.